What lessons can we learn from monsters across cultures? In 2013, I asked myself this very question when setting off to travel abroad for a year. Like so many Americans, I had long been fascinated with monster characters, the horror genre and all things spooky since growing up celebrating Halloween every year. But as much as I loved the ghosts and ghouls that rose from their graves every October thirty-first, at the age of 34, I decided to see what other creatures roamed realms outside the United States. After all, there are countless entities around the globe wreaking havoc on the living. I had no doubt that I would find them just as nightmarishly mesmerizing. “Krampus is the evil companion of St. Nicholas,” I was soon told. In Salzburg, Austria, 34-year old Bertram explained his own cultural heritage. Bertram knew that I had come to the city specifically for Krampus: the beast that terrorizes people throughout Austria and southern Germany each winter. Through couchsurfing—an organization in which people invite travelers to stay with them in their homes—Bertram and I had met online. He had hosted dozens of travelers over the years, but this was his first encounter with someone who had come specifically for a monster. On my first night there, my host described what it meant to grow up with the custom. I pictured the scene, thinking back to my own childhood, Christmas days. They were all sadly monster-free. I couldn’t help but feel jealous. 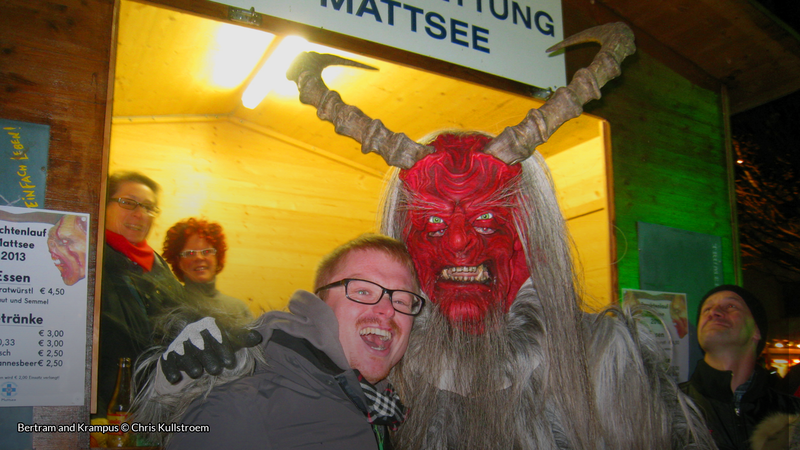 Over the next four weeks, hundreds of Krampuses ran through Salzburg. Ogrish and hairy, with massive horns rising over their heads, they took to the streets lined with Christmas markets and holiday shoppers. Unlike the unobtrusive ones Bertram knew as a child, these wilder, untamed beasts beat people who had specifically gathered to see them. Each Krampus had its own weapon: a bundle of sticks, horse tail or cow tail. Bertram joined me on one of these “laufs” (translating to “runs”). We stood on a packed sidewalk and stared at demon after demon that ran towards us with seemingly no mercy. After a few of them wailed on the people around us but left the two of us pleasantly unscathed, I felt a hand on my back as Bertram pushed me towards the attacks. In a matter of seconds, what felt like a short whip thrashed my thigh, and I jumped at a sharp sting throbbing through my jeans. “Ouch!” I cried, then shoved Bertram playfully. “Hey!” The pain, however, had already dissolved. From then on, I made sure to bolt behind him against further attacks, leaving my host to withstand the full force of Krampus onslaught. Fast forward a few months, and I learned about a strikingly similar creature in northern Japan. Twenty-four-year-old Hikaru had grown up with annual visits from a character known as the Namahage. I gaped at the story, wide-eyed over my rice. The Namahage were clearly more dangerous than any Christmas demon that glared at kids from behind the safety of a saint. The Namahage were just as ogrish, but covered with straw rather than fur, with wide, cruel eyes and teeth painted onto their wooden masks. Hikaru went on to describe the legend of the Namahage: centuries ago, the creatures were said to kidnap women from the town of Oga. The villagers eventually challenged the Namahage to a test: if the creatures could construct a staircase made of one thousand steps back to their home in the Snowy Mountains before sunrise, they could take their women. If they failed, however, the demons would have to leave Oga for good. The Namahage agreed. Hard at work, they were about to lay the final, thousandth step when a villager mocked the sound of a rooster crowing. It was still the dead of night, but the noise suggested morning had arrived. The Namahage were fooled and left Oga without its women, but returned every December for their children instead. Hikaru smiled at the memory. He revealed absolutely no trace of being traumatized in a way that, I knew, I surely would have been. 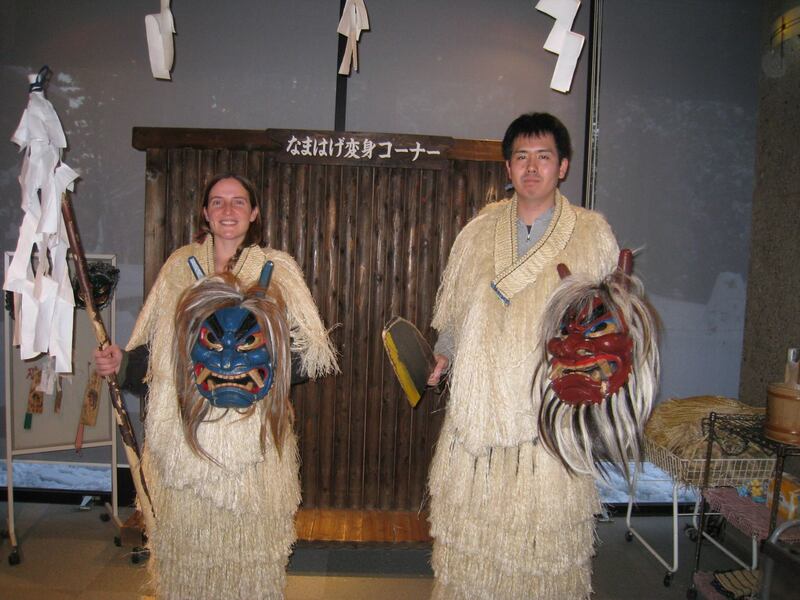 That weekend, my host and I drove to a Namahage festival held each February. In the town of Oga, a reenactment portrayed a typical, home visit from the demons. Masks and costumes were set out on display in a museum dedicated to them, each hand-made from over the centuries. Hikaru and I were even given the opportunity to try on authentic Namahage outfits. “I can’t believe more people don’t want to do this,” I said. Through my demonic mask, which fit over my face like a hockey mask, Hikaru looked proud and defiant in his wicker-based outfit beside me. He shrugged, then posed for a few pictures. “Look!” he later called excitedly. After sundown, we had watched dozens of the cultural demons dance around a bonfire in a field on site. It was colder than I had ever known—the single-digit temperatures felt like something more suitable for Antarctica than Japan. But it didn’t deter the hundreds of visitors from enjoying the show. “Those are the nine hundred and ninety-nine steps the Namahage built in the woods,” Hikaru said, leading me across the snowy field. My frozen face smiled, thawed from his enthusiasm. I would go on to visit eleven countries that year. I stayed with more than a dozen host families and, together, danced with skeletons in parades, admired demons and devils in all sorts of shows and displays. After returning to the U.S., I published a book about the adventures: Drawn to the Dark: Explorations in Scare Tourism around the World. It appeared that cultural monsters did, indeed, have much to teach. Every one of them demonstrated an inherent desire in people to share their stories, to pass on their cultural traditions and connect with others. Krampus and Namahage may have different tactics for ensuring children stay on good behavior, yet both reveal how people growing up with those customs develop deep, nostalgic bonds to them. Bertram and Hikaru were proud to share something that was part of their family heritage and a tradition in their communities. Before my arrival, Bertram hadn’t attended a lauf in several years, and Hikaru had never made the trip to the festival dedicated to the Namahage. But upon making a new friend, both reveled in revisiting an old, monstrous one, and were happy to share an adventure that transcended across cultures. The talented Chris Kullstroem has offered a copy of her amazing book about scare tourism for a lucky #FolkloreThursday newsletter subscriber this month! Sign up for the #FolkloreThursday newsletter to enter (valid February 2018; UK & ROI only). Chris Kullstroem is a life-long Halloween, horror, and dark tourism fanatic. 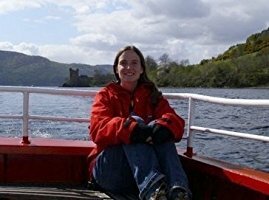 She has researched haunted attractions, cemeteries, ghost tours and other forms of scare-based tourism in the United States, Canada, Eastern and Western Europe, Asia, Australia and New Zealand. Her writing focuses on how entertaining scare attractions blend history, theater and social interaction, and what they can teach us about ourselves and the world around us. Her website is www.monstersandbooks.com.